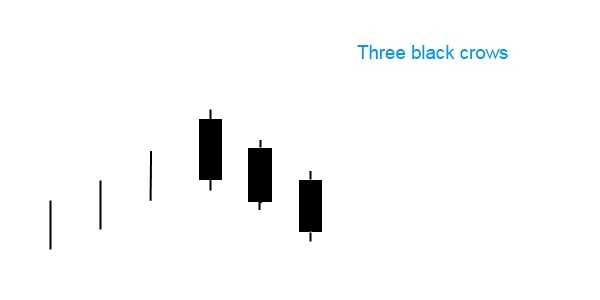 The three black crows pattern is a bearish reversal pattern that consists of three bearish candlesticks that are sinister and dark in color, this is reflected in the name. Crows are often referred to as mark of omen or something bad. So the three black candlesticks caution that it is bad for the market. Each of the three candlesticks in the pattern is relatively long bearish candlestick with each candlestick closing at or near the low price for the period. Each successive candlestick marks an even decline in price and doesn’t have long lower shadows. What happens on the market when the three black crows forms? When this pattern appears in an uptrend, it indicates the possible weakening of the trend and a trend reversal. When the stock is at the peak of an uptrend and trading at resistance, the market participants bargain for a change in trend, due to psychological or fundamental reasons. Subsequently, they tend to sell the stock. This selling activity forms the three black crows pattern. The the opposite of this pattern is the three white soldiers.